As part of a year-long residency and exhibition project, the Philadelphia Photo Arts Center (PPAC) has selected 10 emerging female artists to be a part of the Women’s Mobile Museum. The unique museum provides women with access to art education and opportunities, and the female artists chosen for the residency had little to no access to any kind of art training. 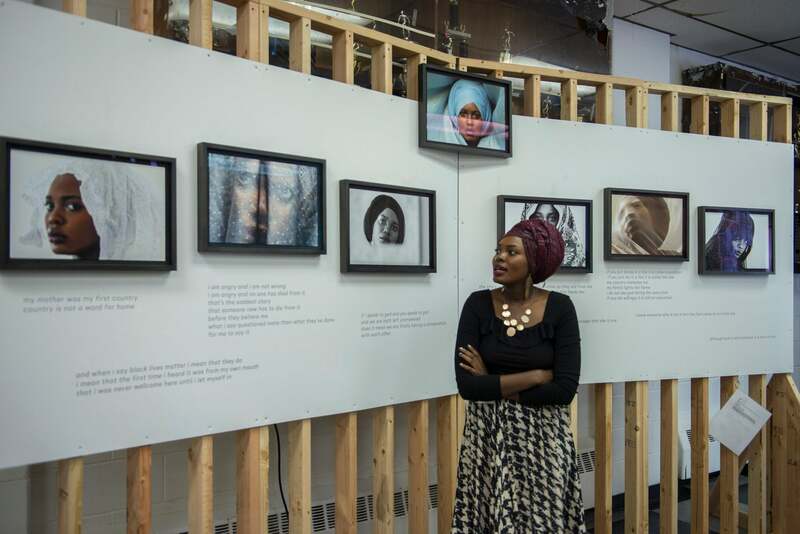 Philadelphia Photo Arts Center creates unique Women's Mobile Museum program. Includes education in photography and videography and financial support. Lori Waselchuk, project director of the Women’s Mobile Museum, says the idea for the museum started out with an invitation to South African visual artist Zanele Muholi to be a resident artist at PPAC. Muholi is known for her work involving the black lesbian and gay community in South Africa and her complex self-portraits from around the world, and she agreed but wanted to make sure it included collaboration with women in Philadelphia. Women's Mobile Museum apprentice and emerging artist Afaq stands in front of her exhibit as part of the Women's Mobile Museum. They developed a 360-degree support structure for a paid one-year apprenticeship. This would include training the women in areas like photography, videography, audio, archive research, and design, as well as providing financial support and psychological support if needed. “We wanted to provide them with the type of support that would allow them to focus, concentrate and give themselves the space they needed to learn and to do the work,” said Waselchuk. They recruited applicants from communities with little access to the arts and met with these women to hear their stories. They didn't consider anyone's portfolio, but rather wanted to hear about their desire to make art and why their current conditions kept them from doing so. The ten women they selected to be Women’s Mobile Museum apprentices were Afaq, Shasta Bady, Davelle Barnes, Tash Billington, Iris Maldonado, Danielle Morris, Shana-Adina Roberts, Carrie-Anne Shimborski, Muffy Ashley Torres and Andrea Walls. In addition to these 10 emerging artists, the exhibition features works by Muholi and South African teaching artist Lindeka Qampi. 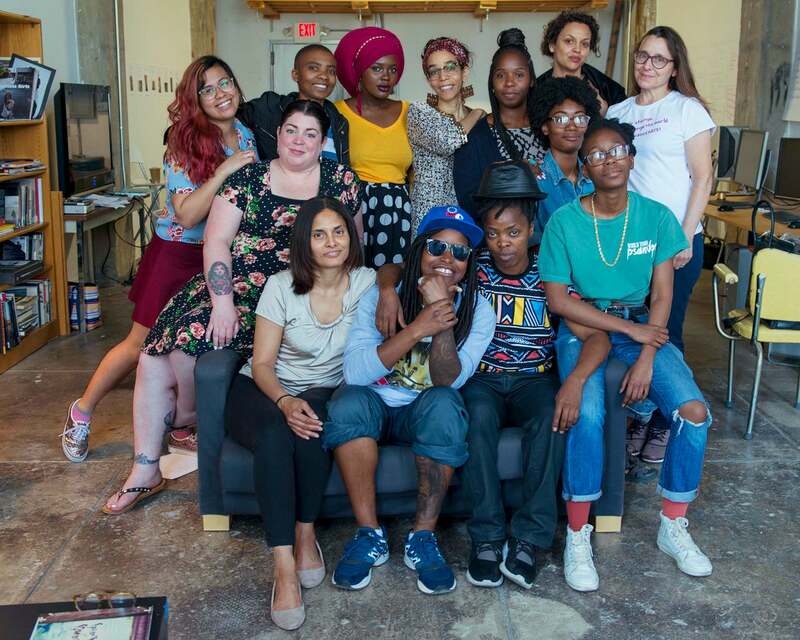 Zanele Muholi (on chair with black leather hat) surrounded by most of the Women’s Mobile Museum apprentices and others from PPAC. Since the theme of the museum and the apprenticeship is providing access to the arts, the museum will be traveling to neighborhoods lacking art programs. A beautiful museum space that can be built inside various community centers gives access to those who have not had it or have not felt welcomed or like they belonged in an art institution. The museum will travel to two different neighborhoods in Philadelphia this fall. Now through October 13 you can find the exhibition at the Juniata Park Boys & Girls Club and October 27-November 17 it will be stationed at the Dixon House. Visit the Women’s Mobile Museum website for more information and follow it along on Instagram @womensmobilemuseum.